As I have stated in the past, just like doctors, we need to give the consumer a checkup on a regular basis since our economy is approximately 70% consumer-based. We need to have a healthy consumer to fuel our economy, which would also help to move the stock market higher. If you look at the chart below, you can see the consumer continues to be in excellent shape. We all have heard that “CASH IS KING”, but over the long term it has actually produced negative returns after you take into account inflation and taxes. If you look at the chart below you can see that stocks have actually been a good hedge against inflation and taxes. I thought it would be a good time to re-revisit the charts below that I have used in two previous blog posts. The first being posted on October 1, 2012 and the second August 5, 2014 where they can be found on majerkoblog.com. I recently read an interesting book entitled “Fooled by Randomness” written by Nassim Nicholas Taleb. It basically postulates that randomness or luck plays a bigger part in investing – not to mention in life– than most people realize. It is something that I’ve personally experienced over the years. I came across this chart and it just confirms everything that I already knew. But it is very illustrative, particularly for my newer clients and readers. If you look at the chart below you can see almost every year there's a decline in the market. Occasionally, there are major declines. But guess what? The market (S-P 500) has had positive year-end total returns 24 out of the last 29 years. My long time readers and clients know that I am a big believer in contrarian indicators. In essence, it is not following the herd. As Warren Buffett states “Be fearful when others are greedy and greedy when others are fearful”. If you look at the chart below, only a little more than half of US adults are invested in the stocks even after a long bull market. I thought I’d take a moment to think about where the stock market has been and where it may go. We’ve come a long way since those dark days of 2008 and 2009, when it looked like the whole financial system was going to break apart. It seems to me that this has to be one of the most underappreciated bull markets in history. I like that. I am often asked by recent retirees, “Now that I am retired do I need to have a portion of my portfolio invested towards growth?” My answer is a resounding YES! 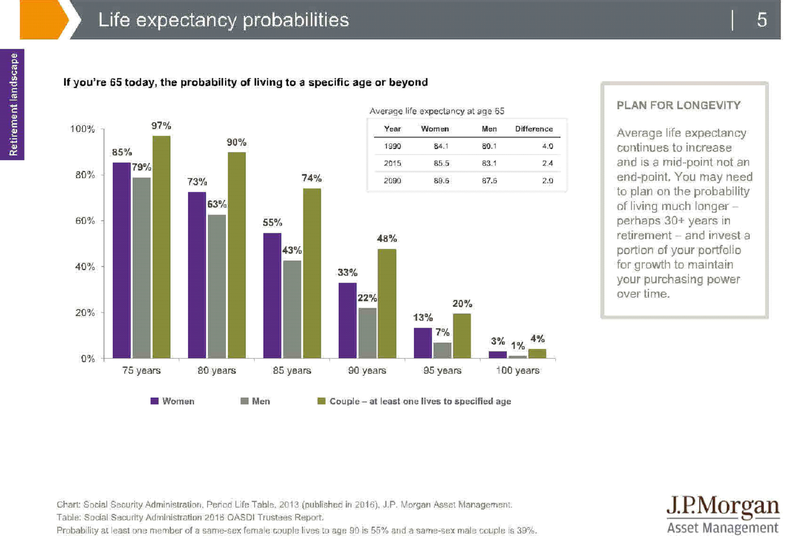 Take a look at the Life Expectancy chart below. I’m always looking for indicators to tell where earnings are headed. As you know that’s what I believe drives stock markets in the long run. The ISM Purchasing Managing Index is one of the many tools I look at to see where earnings may be headed. The chart below shows a recent uptick in this index which may bode well for markets going forward.